"Almandin" redirects here. For the racehorse, see Almandin (horse). Not to be confused with Amandine (disambiguation). Almandine /ˈælməndɪn/, also known incorrectly as almandite, is a species of mineral belonging to the garnet group. The name is a corruption of alabandicus, which is the name applied by Pliny the Elder to a stone found or worked at Alabanda, a town in Caria in Asia Minor. 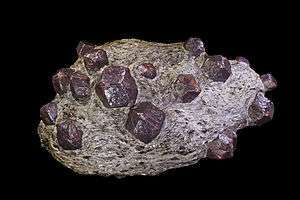 Almandine is an iron alumina garnet, of deep red color, inclining to purple. It is frequently cut with a convex face, or en cabochon, and is then known as carbuncle. Viewed through the spectroscope in a strong light, it generally shows three characteristic absorption bands. Almandine is one end-member of a mineral solid solution series, with the other end member being the garnet pyrope. The almandine crystal formula is: Fe3Al2(SiO4)3. Magnesium substitutes for the iron with increasingly pyrope-rich composition. 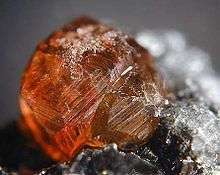 Almandine, Fe2+3Al2Si3O12, is the ferrous iron end member of the class of garnet minerals representing an important group of rock-forming silicates, which are the main constituents of the Earth's crust, upper mantle and transition zone. Almandine crystallizes in the cubic space group Ia3d, with unit-cell parameter a ≈ 11.512 Å at 100 K.
Almandine is antiferromagnetic with the Néel temperature of 7.5 K. It contains two equivalent magnetic sublattices. This article incorporates text from a publication now in the public domain: Chisholm, Hugh, ed. (1911). "Almandine". Encyclopædia Britannica (11th ed.). Cambridge University Press. Wikimedia Commons has media related to Almandine. Look up almandine in Wiktionary, the free dictionary.